Description Based on the original dashgame by Nate 19. The original game was based on geometry dash. The game still has most things but some new things have been added in as well. 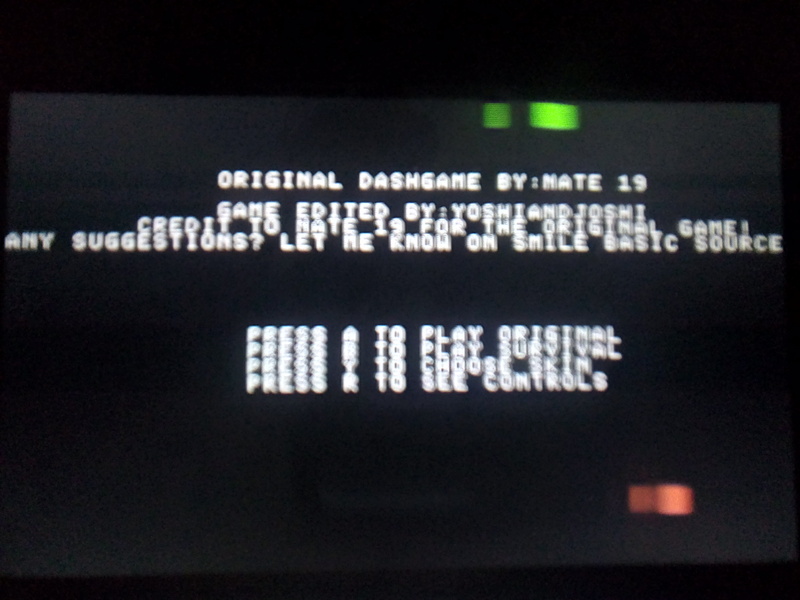 • different sprites • more bgm • Gameword system Instructions To use the program set the project as the active project,go to browse projects and select the game file (dashgame_ver2) . Go back to create programs with smile basic and run. 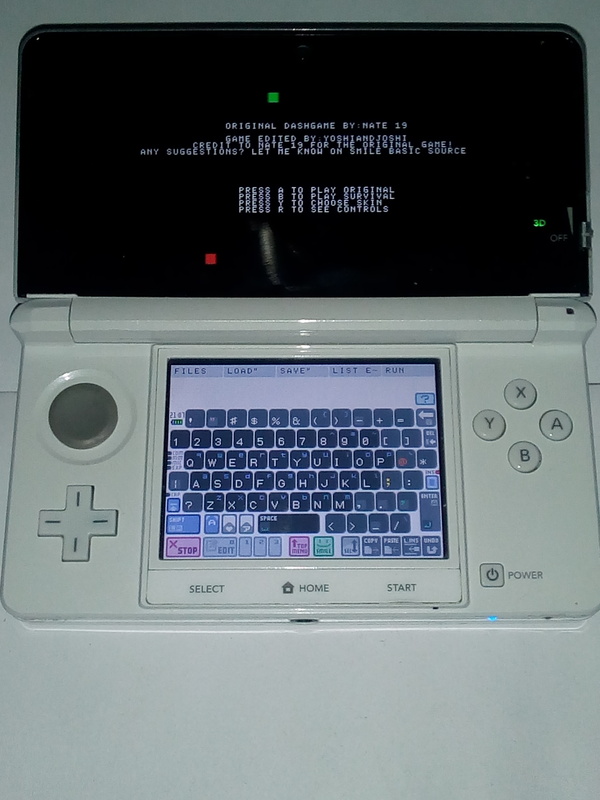 Press the A button to jump Gamewords are words that unlock secret things in the game. Credit to Nate 19 for the original game. Enjoy. 19 Comment(s) Yoshiandjoshi123543 Beginner Programmer I'm just starting out! I'm still trying to grasp the basics. Programming Strength Video Games I like to play video games! Hobbies 11 months ago Btw I just didn't use those buttons as much for whatever reason but now I do. Yoshiandjoshi123543 Beginner Programmer I'm just starting out! I'm still trying to grasp the basics. Programming Strength Video Games I like to play video games! Hobbies 11 months ago I mean @LVL4BEGIN CyberYoshi64 Intermediate Programmer I can make programs, but I still have trouble here and there. Programming Strength Night Person I like the quiet night and sleep late. Express Yourself 11 months ago BTW Is your browser lacking "Reply" and "Edit" functionality? If it does so you might need a different browser. Yoshiandjoshi123543 Beginner Programmer I'm just starting out! I'm still trying to grasp the basics. Programming Strength Video Games I like to play video games! Hobbies 11 months ago No, The "reply" and "edit" buttons are available in my browser. I'm using the Google Chrome browser on my phone. spaceturtles Video Games I like to play video games! Hobbies Avatar Block I didn't change my avatar for 30 days. Website Intermediate Programmer I can make programs, but I still have trouble here and there. Programming Strength 11 months ago Gui issues? CyberYoshi64 Intermediate Programmer I can make programs, but I still have trouble here and there. Programming Strength Night Person I like the quiet night and sleep late. Express Yourself 11 months ago Well, SBS works fine on my tablet with Google Chrome with no further issues. Maybe some settings mess it up. Or he/she doesn't use it for whatever reason. Yoshiandjoshi123543 Beginner Programmer I'm just starting out! I'm still trying to grasp the basics. Programming Strength Video Games I like to play video games! Hobbies 11 months ago Btw Cyberyoshi64 I put the credit for the congratulations! Screen in the program near @LVLBEGIN and I also put it in the game discription. Yoshiandjoshi123543 Beginner Programmer I'm just starting out! I'm still trying to grasp the basics. Programming Strength Video Games I like to play video games! Hobbies 11 months ago Thanks for the graphics ideas. It looks great.i may add this to the game. Btw If you have any more ideas for the game just let me know. Yoshiandjoshi123543 Beginner Programmer I'm just starting out! I'm still trying to grasp the basics. Programming Strength Video Games I like to play video games! Hobbies 11 months ago Btw if you would like to help with the game Just let me know. CyberYoshi64 Intermediate Programmer I can make programs, but I still have trouble here and there. Programming Strength Night Person I like the quiet night and sleep late. Express Yourself Edited 11 months ago I'd like to help you as an programming assistant. 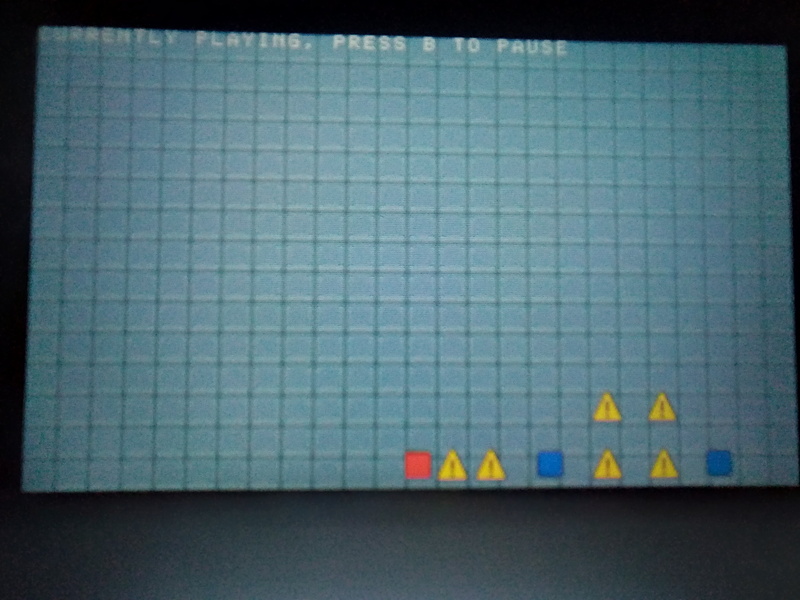 I'm working on a modified version of GAME3JUMP and here's something I even implemented in. If you finished the game with a score higher than a given one, the player will be presented with a colorful "CONGRATULATIONS!" string. It's a suggestion and I will give you my graphics for this, if you'd like this in your game. (I'll credit myself XD)43V31EJD Yoshiandjoshi123543 Beginner Programmer I'm just starting out! I'm still trying to grasp the basics. Programming Strength Video Games I like to play video games! Hobbies 11 months ago I know, the game is a bit basic. it's basically a remake of the original dashgame which was a pretty basic game as well. This is also the very first program I have posted. Anyway it's good to see that you like the game. I might add more stuff to it in the future so make sure to check back soon. Yoshiandjoshi123543 Beginner Programmer I'm just starting out! I'm still trying to grasp the basics. Programming Strength Video Games I like to play video games! Hobbies 11 months ago The poll was about what you think about the game. The options were. It's great It's good It's ok It's bad It's really bad CyberYoshi64 Intermediate Programmer I can make programs, but I still have trouble here and there. Programming Strength Night Person I like the quiet night and sleep late. Express Yourself 11 months ago It's similar to the Nintendo eShop Ratings. lolIt's good (★★★☆☆) I like the concept of a box walking through a stage and avoiding attention signs-shaped spikes (similar to Geometry Dash (if someknows it?)). Nice Mario easter egg! =)It's not your fault but the graphics and the text are too basic for such a game. Yoshiandjoshi123543 Beginner Programmer I'm just starting out! I'm still trying to grasp the basics. Programming Strength Video Games I like to play video games! Hobbies 11 months ago CyberYoshi64 Intermediate Programmer I can make programs, but I still have trouble here and there. Programming Strength Night Person I like the quiet night and sleep late. Express Yourself 11 months ago Polls don't work on 3DS... Not even content will be displayed. Could you tell me what the question of the poll is? Yoshiandjoshi123543 Beginner Programmer I'm just starting out! I'm still trying to grasp the basics. Programming Strength Video Games I like to play video games! Hobbies 11 months ago Btw how did you get your animated profile pic to work? CyberYoshi64 Intermediate Programmer I can make programs, but I still have trouble here and there. Programming Strength Night Person I like the quiet night and sleep late. Express Yourself Edited 11 months ago Just click your avatar. Depending on where you use SBS. In High Compat Mode click your Avatar at the top left corner of any page (except 404). Click the blue USER icon and ...a teeth or a screwdriver? (IDK). Then find "New Avatar" and use an image with a valid GIF format and a ".gif" extension. And there you go. Yoshiandjoshi123543 Beginner Programmer I'm just starting out! I'm still trying to grasp the basics. Programming Strength Video Games I like to play video games! Hobbies 11 months ago Oops there was supposed to be a picture of the game on this page. But for some reason it didn't show. auceps OSP Contest 1 Contest Participant I participated in the first SmileBASIC Source OSP Contest! OSP Contest 2 Contest Participant I participated in the second SmileBASIC Source OSP Contest! OSP Contest 3 Contest Participant I participated in the third SmileBASIC Source OSP Contest! 11 months ago what picture?